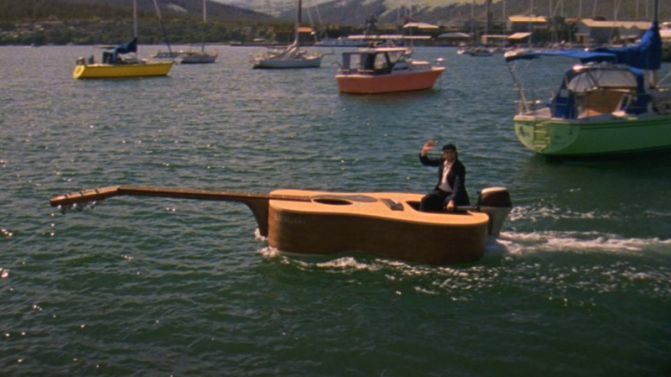 Josh Pyke is looking for his guitar boat that he used in his his 2008 music video for ‘Make You Happy’ and he needs your help finding it. As News Limited reports, the boat, named SS Matin, was sold for $7,000 back in 2009 in an Ebay auction with proceeds going to the Indigenous Literary Foundation. It seems Pyke is feeling a little nostalgic though and he wants to see it again. Pyke has been going through his old works for a Best of, B-side & Rarities album and he’s suddenly become interested about the boat’s whereabouts. It was thought to be at Russell Crowe’s Museum Of Interesting Things near Grafton but the Muso has found that it’s actually not there leaving him at a dead-end. “I’ve asked everybody but we don’t know who bought it. It could be sitting in a warehouse somewhere or it could be sitting on someone’s dam,” he told News Limited. He’s promised that if someone does manage to find it, he’ll take it out for a spin on the harbour once again like he did in the music video. If you know exactly where it is, chuck Pyke a message on social media and maybe he’ll take you out on the harbour with him in the boat. His Best of, B-side & Rarities is out tomorrow.